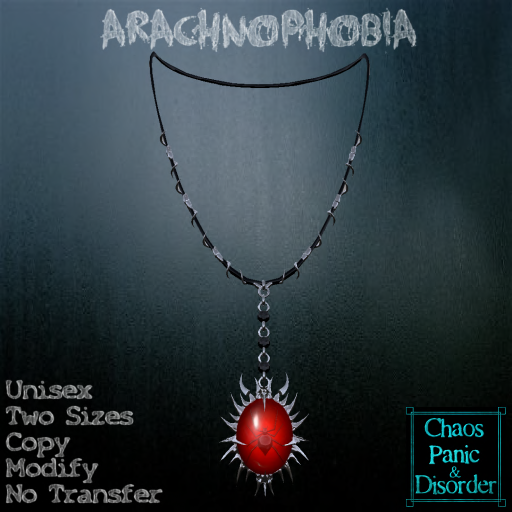 Lilah Munster: :*:CPD:*: Arachnophobia Necklace - A black widow spider suspended in amber pendant, attached to a black cord. The pendant and cord both feature twisted, "spiderleg" silver fittings. Copy/mod, comes pre-fitted in two sizes, one for female avatars, one for males. Lilah Munster: :*:CPD:*: Arachnophobia Ring - A signet ring that matches the necklace. 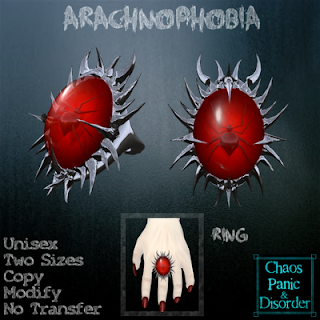 Also copy/mod, also prefitted for male and female avatars. Lilah Munster: :*:CPD:*: Lip Cage - Four interlocking rings seal your mouth shut... so you can't scream about the spider crawling up the middle of the rings across your lips.